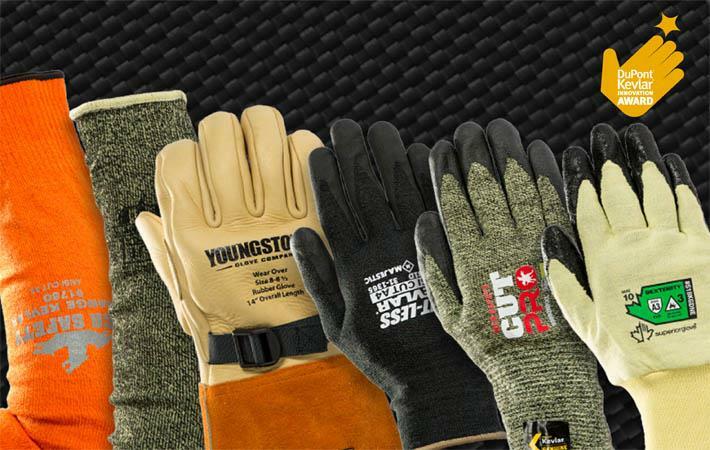 Majestic, MCR Safety, Protective Industrial Products (PIP), Superior Glove Works, Youngstown Glove have won the fifth-annual DuPont Kevlar Glove Innovation Awards. The awards mark excellence in innovative glove and sleeve designs from DuPont Kevlar licensees who push the limits of what is possible to make work gloves and sleeves more durable and protective. Innovation in this area is critical to worker safety. According to the Centres for Disease Control and Prevention, the hand is the leading body part injured at work and treated in hospital emergency departments, with hand injuries sending more than 1 million workers to the emergency room annually in the United States. Winning entries were chosen based on designs that utilised Kevlar fibre in the glove and sleeve construction, were unique and groundbreaking in their approach, and challenged the boundaries of conventional cut protection. Entries were judged on a set of criteria based on excellence in the areas of innovation and benefits to the wearer including enhanced protection, increased dexterity, comfort and durability – all critical to safety and performance in the toughest industrial environments. This year’s award winners were announced at the 2018 National Safety Council Congress & Expo in Houston, Texas. Majestic was awarded for its 31-1365, a lightweight glove designed with Kevlar for high cut resistance, comfort and dexterity. This new combination of materials created a comfortable, breathable, lightweight cut-resistant glove that doesn’t sacrifice mobility and has a palm coating that allows users to utilise touch screens. MCR Safety has been recognised for its 93892NF, MCR Safety Cut Pro Series containing Kevlar combined with steel/synthetic materials to achieve an A9 cut level. This new combination of materials offered the highest level of protection for steel fabrication applications. MCR Safety has also got recognition for its 9178OT, 9178O, 9174O, 9174OT, cut level ANSI A5 sleeve featuring 100 per cent patent-protected, high visibility orange DuPont Kevlar engineered yarn. This is the first sleeve available in Cut Level A5 in a high-visibility orange yarn made of Kevlar, and the design has the added benefit of a better fit than a traditional tube sleeve. Protective Industrial Products (PIP) got the award for its 10-KVSYBH series, Single-Ply Kevlar Armor Blended Sleeve comprising the DuPont Kevlar 14/2's yellow/black heather yarn. This combination achieves ANSI A6 cut protection with a blousy fit that can be used over arms or clothing without sacrificing dexterity. Superior Glove Works has got the honour for its S18KGDNE Dexterity cut-resistant glove made with 18 g Kevlar composite filament fibre shell of protection that is the world’s thinnest, most comfortable arc flash level 3 rated glove. Eighteen needles per square inch are used to create this thin glove that preserves the manual dexterity of the user. Youngstown Glove has got the award for its 16-5200-14 glove protector, a flame resistant 14" High Voltage Leather Protector with Kevlar. Using a unique process where Kevlar is attached to the leather prior to cutting and sewing, the construction allows the protective qualities of Kevlar to work with the glove and avoids the feeling of bunching or a loose liner.